Small backstreet pub with good range of beersin good condition. Worth the walk to find it. I didn''t care for some of the customers, either. One group of 6 plus 2 children managed to effectively push a woman off of her table by sitting near her then gradually encroaching on her space until they were practically sitting in her lap. She moved to another table eventually. They parked a push chair in the doorway, effectively blocking the way in. They seemed at home there so might have been regulars. They do food here. It''s meant to be good but I didn''t want to risk it unless the table had been sprayed with a disinfectant spray first - something which seemed unlikely to happen very often, given the state of the table in the first place. The whole place didn''t look like it had had a good clean since they brought in the smoking ban. They could do with taking all of the old tins off of the wall and giving the whole place a good pressure wash. This pub is made by the really attentive staff who know their business and offer a real service. 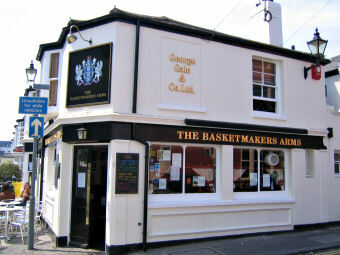 Small pub that has a charming friendly atmosphere. A busy bar that attracts all ages and they are a very decent crowd. A good range of beers but I stuck to the Seafarers on my visit as it was served spot on. One of the best proper pubs I have been to for awhile. Did not try the food but it looked good and popular.